Motorola has officially taken the wraps off its first ROKR phone, the Motorola ROKR E1. Apple announced the device in tandem with Motorola at an event this morning in California. Motorola is throwing a party for the E1 this evening in NYC and MobileTracker will be there to get a hands-on look at the E1. The ROKR E1 is the phone that was called the E790 in some rumors. Design wise it's very similar to the popular E398. The E1 is also the model that was approved by the FCC late last month. 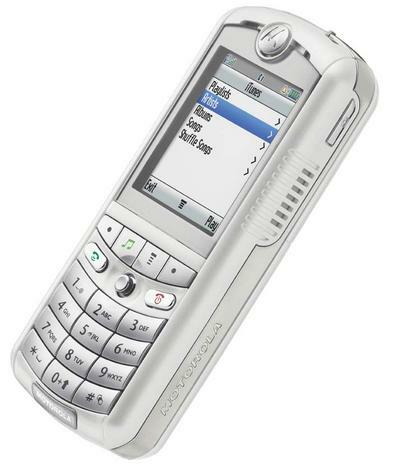 The Motorola ROKR E1 is a Cigular exclusive currently, but this is just the first of several ROKR models. Cingular is now selling the E1 for $249.99 with a 2-year service agreement. Readers may remember that Motorola showed off a ROKR model at the annual analyst meeting in Chicago recently and it was different from the E1 (it had a front camera which signals that it is a 3G handset). Read on for more photos of the E1.